The Houston Fringe Festival Returns to MATCH for 11th YEAR! For more information please visit www.houstonfringefestival.org. The 2018 Houston Fringe Festival (HFF) returns to Midtown Art & Theater Center Houston (MATCH) for its eleventh year! This year the festival has expanded to a two-week format, and features performing artists from Houston and beyond. The festival will be housed in two of the MATCH’s theater facilities, Matchbox One and Matchbox Two. This year’s roster includes evening-length work by festival favorites the Pilot Dance Project, jhon r. stronks, Ivan Espinoza, Invisible Lines, PMT Productions, and Suchu Dance. For the first time in the program’s history, the festival is supported by a Tourism Incentive Program grant from Houston First Corporation and Visit Houston in partnership with Hotel Icon, the East End Foundation, and Mister McKinney’s Historic Houston Tour Bus. Anything Goes Weekend One September 9 at 8:00pm – The Houston Fringe Festival’s signature closing night event has expanded to two nights due to popular demand and an increase volume of applicants. Anything Goes Weekend One will be presented in Matchbox One and will feature new work from Kay Aldshead, Fight With Love!, Tory Pierce, Neil Ellis Orts, Marcus & Jess, Margo Stutts Toombs, and Tek Wilson. Anything Goes Weekend Two September 16 at 8:00pm – Anything Goes Weekend Two will be presented in Matchbox Two and will feature a roster of some of Houston’s most compelling dance artists, including Shanon Adame, Daniela Antelo & Brenda Cruz-Wolf, Ayan Felix, Nicola Bennett, Ty Lewish, the Pilot Dance Project/Adam Castsaneda, Emily Sayre, Gaby Luna, M2/Tina Mullone, Samuel Burkett, Julia Rubio, ArtisticEdge/Katie Trevino Lammers, and Elizabeth Sutton. The Sky Was Wild with Sunshine scans the current horizon of diminishing compassion and humanity, explores what we want the world to be, and looks toward the divergent futures of whether we will or won’t stop the current cycle of gray-skied ambivalence. The inhabitants of Horn’s latest creation look upward and beyond their immediate reality to fervently plant and nurture seeds of kindness, love, and joy. The Sky Was Wild with Sunshine is a prayer for peace shouted into the void. It is a tiny piece of hope planted with intention of life-giving abundance. It is a reaffirmation to love bravely and with abandon. This project seeks to shake off the darkness and build a utopia out of curbside castoffs, little pieces of string, and whatever other beautiful things we see. In a world where fear and misinformation are weaponized, The Sky Was Wild With Sunshine offers an alternative of compassion and warmth. With dancers Shanon Adame, Adam Castaneda, Angela Cohen, Lindsay Cortner, Cloe Leppard, Holly Moran, Amy Phillips, Kristina Prats, Emily Sayre, and Hoan Tran. Ashley Horn is a dancer, choreographer, filmmaker, dance educator, costume designer, and artist from the Houston area. She has shown choreography and films at ACDF, The University of Houston, Big Range Dance Festival, The Texas Weekend of Contemporary Dance, Third Coast Dance on Film Festival, The Houston Fringe Festival, and Dance Month at the ERJCC among other venues and events. She has created costumes for FrenetiCore, Frame Dance Productions, Open Dance Project, Sara Draper, Teresa Chapman, The Pilot Dance Project, Hope Stone Dance, and her own works. Ashley is a two-time recipient of an individual artist grant from the Houston Arts Alliance for choreography. She has been the artist in residence at Hope Stone, Rice University, and Dance Source Houston. Ashley is the Early Childhood Education Specialist at Hope Stone, Inc.
For centuries, poets and mystics spanning world cultures have regarded Earthly bodies such as cacti and mushrooms as “DIVINE MESSENGERS” glistening with with songs of other-worldly knowledge. Biologists have also discovered that trees actively collaborate with underground mushroom networks, called Mycelium, to communicate extensively and share resources. These fungal networks are highly sentient — capable of perceiving everything from physical touch to sound — and just as responsive as our own complex neural networks. But the songs and intelligences of the Mycelium and her mushrooms are incredibly subtle. They can hear us, but what will it take for us to hear them? In a Post-Fordist, Capitalist society, what will it take to slow down and notice the vibrant matter that lies so close at hand? 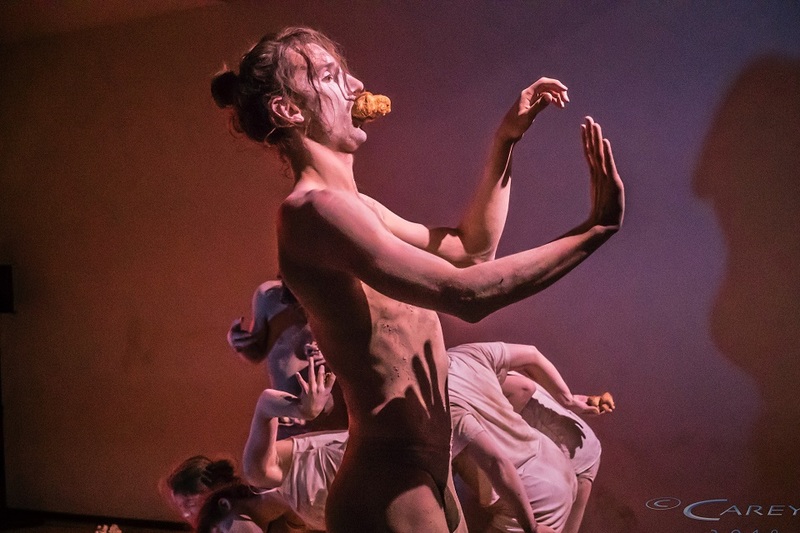 In this durational Butoh performance, human bodies will attempt to commune with Mushroom bodies, skin to skin, pore to pore. We will begin by attempting to dissolve the body as we experience it in our everyday lives, to allow for metamorphosis and transformation. In this altered experience of the body, normal perceptions of space and time cease to exist, and we can, perhaps, become more attuned to the infinite rhythms of the Ecosphere. The flesh of the mushrooms will be hooked up to motion sensors and electrical connectors that perceive the electromagnetic variations from the surface of mushroom caps to the root system of the mycelium and translate them to sounds, and thus, actively participating in the creation of a somatic, sonic tapestry. Join us as we immerse in a world of Deep Ecology where human bodies are invited to exchange possibilities with every cap and stem, with each textured surface and vibrating entity that emanate divinely terrestrial songs from the worlds of soil and stone. In a final appearance before Artistic Director Jennifer Wood leaves the country, Suchu Dance will premiere Mkay (Everything’s going to be all right, or whatever) this September as part of the Houston Fringe Festival. This promises to be Suchu Dance’s most innovative work to date, and possibly the last opportunity to see a Suchu Dance performance in Houston for some time to come. Wood has thrown out the rulebook for this latest work, in fact she’s thrown out the rulebook for her whole life. Lets see what happens. Lets see if you can float. Lets see if you can survive without everything that you once held dear and necessary for your existence. 14 people packed in a tiny space dancing furiously for one hour. What could go wrong? Everything, and that is the fun part. These dancers are stepping outside of their comfort zones, beyond what they thought they were capable of physically and expressively. Imbued with a lush and nuanced movement vocabulary, an open vulnerability and an undercurrent of hilaritas, Mkay (everything’s going to be all right, or whatever) speaks to an ambiguous, uncommitted (maybe even pessimistic) optimism about the future. Come and lose yourself in this unique performance experience. In partnership with The Pilot Dance Project, PMT IS FRINGE brings together Houston-based singers, dancers, and musicians to tell their unique and personal stories through live musical theater and commercial music performances. This concert-format production, accompanied live by The PMT Band, is representative of PMT’s signature performance event, Midtown Live, which after a year off, will be presented again in full this fall. Performance Artist and Choreographer jhon r. stronks presents Naming Rainbows, an evening of performance combining song, dance, drag and gender blending performance. #DiscoWitch Miss. Understood initializes her #RestorationSoftware using her femme expressive embodiment and assertive presence toward an effort to honor queer illumination without dismissing the dark conditions that surround it. 9/16 @ 3pm and 4:30pm Silver is a 45-min production inspired by the grandmother of YungChris. Through live music, poetry, contemporary and street dance, YungChris will take you on a creative journey through his interpretation of Sylvia Jefferson; the Southern Baptist faithful , matriarch, mother, grandmother, great grandmother and friend. In Silver, a queen will be crowned. Group Acorde, one of Houston’s most celebrated new dance ensembles, present an evening of new dance and conversation at the 2018 Houston Fringe Festival as part of its 2018-2019 season. Group Acorde came to life with the desire of two contemporary dancers and two jazz improvisational musicians to be a group that truly collaborates in all aspects of the creation process. The company strives to produce high quality work combining original music and contemporary dance choreography, where all artists conceptualize the works from beginning to end. Its mission is to cultivate and educate audiences through live performances. Group Acorde strives to broaden its reach by partnering with other organizations that can guide us to communities that may not otherwise have access to such opportunities. In its first and ongoing second season, the company has produced a full evening performance titled Unemojional, performed at two well established Houston festivals, Barnstorm Dance Fest 2016/2017 and The Dance Month at the Kaplan Theater, created seven “pay what you can” classes as a way to reach out to the community, partnered locally with Nicole Longnecker Gallery and Plus Fest creating site specific works, and most recently performed for over 3,000 people at Miller Outdoor Theater as part of Dance Asia America’s East Meets West annual program. Acorde, a Portuguese word, means “wake up” and also means “chord”. The definition of chord in the English language is “a combination of usually three or more musical tones sounded simultaneously” which reflects the collaborative spirit on which Group Acorde was created. 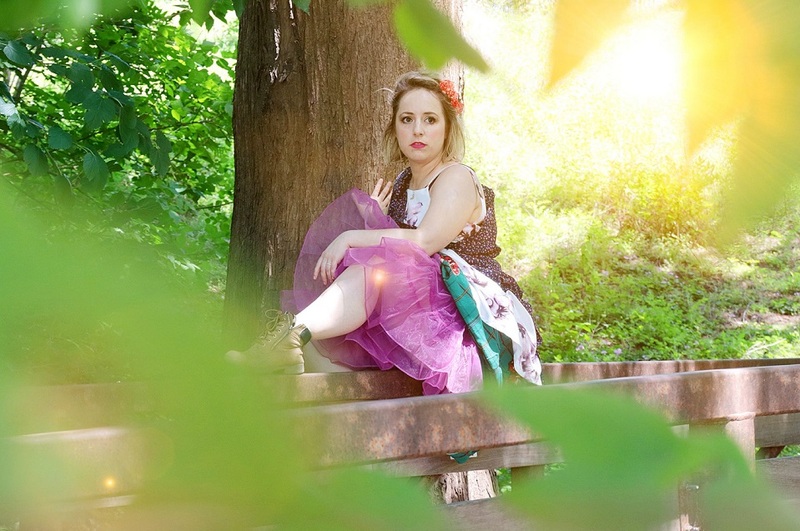 Gorda is a one woman show written by Sara Ornelas. Through music, storytelling, and theater, she examines various stages of her life when her talent for vulnerability has kicked me in the face. She celebrates her Latinx roots in a Mariachi suit lip sync and pays tribute to her hometown, Brownsville, Texas.To demonstrate her anxiety she personifies insecurity and judgement as two Mean Girls pretending to be her friends. By performing some of her deepest fears, Sara hopes to bring comfort to anyone who has eaten a whole half gallon of mint chocolate chip ice cream in one sitting…twice. Mariposa is a theatrical and dance interpretation of the poetry of Sharon Marie Olson, tracking her journey from lover, to expecting mother, to young single mother experiencing the depths of the bonds between mother and child. It explores themes of expectations, fears, ecstasy, trepidation, and hope in the cycle of birth and regeneration from the point of view of the divine feminine. The structure of the cycle will follow the four archetypal elements, going from hot to cool, like a fever breaking: fire, air, water, earth. Selected dance performances will be choreographed by Autumn Kiskinis and other to-be-determined performers, matching the progress of the four elements and the poetic “story arc” of the pregnancy-to-birth-to-bond cycle. Original music scores accompanying the dance and recitations will be performed live and pre-recorded by Baltazar Canales and Michael Hollander. The Fringe Dance Card will showcase original modern and contemporary dance works from Beckles Dancing Company, Juxtapose Arts Collective, & M2. Juxtapose Arts Collective will present two original works, Marcy and Star Talers, choreographed by Houston local Cara Shanks. Marcy delves into the imagination of a young girl home alone – who turns her surroundings into a zombie nightmare. This dark fantastique takes a turn into a zombie disco. Be sure to come see the fate of Marcy, performed by Juxtapose II company member, JoJo Miles. Ending on a softer side, Star Talers, originally performed in Fables is a work inspired by the writings of the Brother’s Grimm. A homeless woman finds herself standing in the cold when beggars begin asking her for the clothes off her back. The last beggar is a young girl shivering in the cold who has absolutely nothing. The homeless woman selflessly gives the dress she is wearing to the young girl to stay warm. Because of her humble acts, gold talers (gold money) begins to fall from the sky and she is given a brand new dress made of the finest linen. She lives the rest of her days in comfort and warmth because of her giving character. 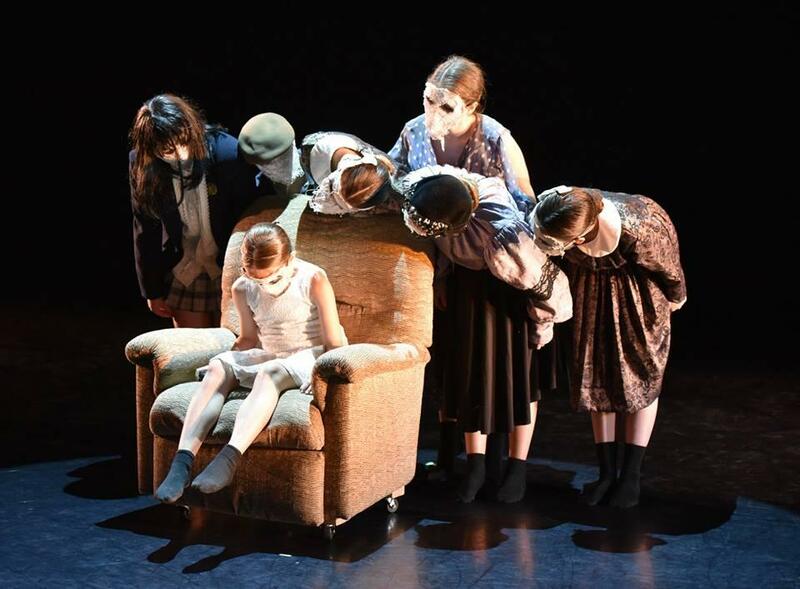 The Juxtapose Arts Collective professional and pre-professional company (Juxtapose II) will perform Star Talers together in a heartwarming work that will make you appreciate all of you have. M2 will present Sesion, a musical/movement exploration initated by the ideas of the senses. The sound of the piece will contain an underpinning of repeated musical ideas that are colored, then shadowed, then completely covered by noise. The noise elements slowly dissipate revealing musical ideas now marked by the residual effects of the noise. Also on the program is Beckles Dancing Company from Dallas. The company will present Claret Tango, a duet speaking to interdependency, space, intimacy, and relationships. The Houston Fringe Festival is excited to present the world premiere of a new feature film by director Willie Napiers. High school dropout Guadalajara Bustamante has a troubling home life, but she is close to her mother Sonya. While coming to terms with her identity she befriends Coneja and Esme, the neighborhood queen bees. They talk Guada into experimenting with drugs, exploring her sexuality, and shoplifting-but before long Sonya realizes she must step in and stop her daughters destructive lifestyle.